There’s another one in there about blaming God for our imperfections, as if the fact that we are stubborn, greedy, irritable and dishonest were the result of divine dereliction of duty. I think the man on his knees is right about God’s attitude. God really can’t be bothered. No matter how nicely the man asks, or how often, it is unlikely that his prayer will get God’s attention because “becoming better persons” has so little to do with the divine project laid out in the Scriptures. To be sure, the Bible contains plenty of commandments and rules that we are to live by. It has plenty of praise for the blameless and the upright, and plenty of condemnation for the wicked and the lawless; but the Bible is also persistent in acknowledging that no one, no matter how observant of God’s commandments, no matter how “good” a person he or she may become, can claim moral rectitude in God’s sight. Even more, everywhere you look in Scripture a paradoxical undercutting of God’s own command to obey the commandments keeps cropping up. Some of the people who sin most often and most flagrantly in the Bible are people after God’s own heart whose sins seem only to bind them closer to God, even when God does not hesitate to punish them for what they’ve done. Personal makeovers used to be a hot thing on reality TV. These shows featured people who were massively unhappy with their bodies. They were whisked away from their family and friends for months on end and received tens of thousands of dollars’ worth of facelifts and nose jobs and tummy tucks and dental work. They returned home to a grand “reveal” and, they supposed, to the end of their problems, and a truly new life. Because Lent is a time of repentance and conversion, we have been taught that it is also an opportune time to try to become a better person. Many people treat Lent as a time to re-make failed New Year’s resolutions to quit smoking, eat less, spend more time with the family, or take on some extra benevolence, some good deed. And if the turn of the calendar page to the Lenten season serves as a jump-start for self-improvement projects, so be it; but if the Scriptures are any indication, God will not be bothered to be of very much help to us in those projects as long as our sights remain so low and our expectations so small as to confine ourselves to becoming better persons. What else is there, then? What is the larger horizon, the deeper quest? The thing that makes for sinning saints, for giants of God who were not always also giants of moral virtue? 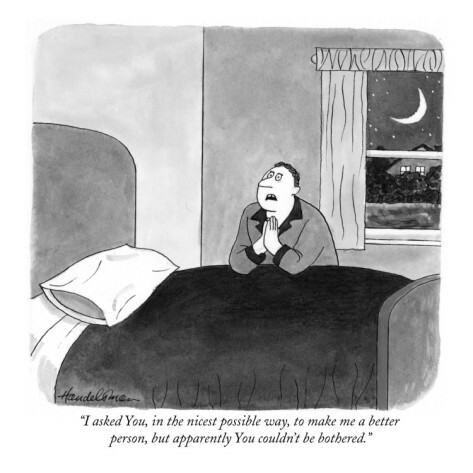 What other prayer can we make by our bedsides if not the prayer of the man in the cartoon “to become a better person?” And how might we spare ourselves perpetual disappointment in a God who can’t be bothered? We could ask God, to paraphrase Eugene Peterson, to be made forever unwilling to be the subjects of our own little life projects, and to let ourselves instead be participants in who God is and what God is doing in us and in the world. We could ask to be given the grace to step away from the center of our own self-preoccupied universes, even our religious and moral ones, and to be drawn instead into the mystery of divine action in, for, with, and through us. We could ask to be led into a place empty of landmarks, a wilderness filled not only with wild beasts and wilder devils; a place not only of disorientation, temptation and moral danger; but also, as Scripture attests in many foundational stories, a place illumined by what Rowan Williams calls “a ray of darkness,” full of undreamed possibility. A place of the most profound re-making of a different kind, a time and a space for God to speak through uncluttered air not to our behaviors nor to our need for things to make moral sense, but simply to our hearts. He comes up out of the waters of the Jordan, having been baptized by John and confirmed in his identity by the voice from a cloud. Then the Spirit drives him in the wilderness for forty days, where he is tested by Satan to see what sort of “Son of God” we have here; and whether this Son of God will accept the vocation to be fully and dangerously transparent to the life of the God who loves him fiercely, whom he loves fiercely, and by whose moving Spirit he lives and acts for us and our salvation. 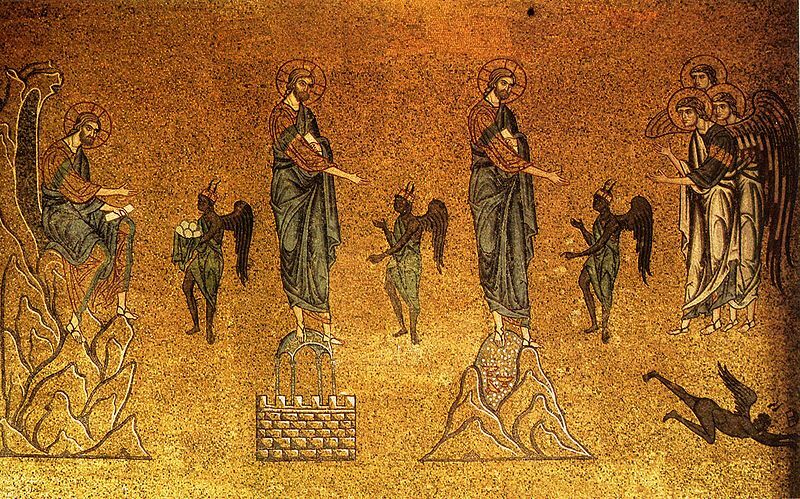 Out there, Jesus defeats the devil’s lie that he, and by extension any of us, can rightly seek a deeper, more meaningful, more successful and happier life – including a religious life – without being deeply immersed in the only true life there is, the life of God, a life that is mostly mystery. Jesus’ victory over Satan in the wilderness was not a victory of moral virtue. To be sure, our traditions teach that Jesus was a sinless man, but it is not because he was sinless that he triumphed. He didn’t beat evil because he was good and getting better. Even though he is the protagonist, the story is not even about him—not Jesus as a tower or strength and the answer to every question, anyway. It is rather about Jesus-in-God and God-in-Jesus. It is about the way Jesus has for forty days had his heart enraptured and refined so that it is fixed on God and God’s concerns in such a way that when the devil tempts, all Jesus can say in reply to every blandishment is “God” – we live by God’s word, we worship God alone, God is not to be tested. The story is about God who is not responsible either for our sins or for our earnest acquisition of virtue, who is not in the business of moral makeovers or of things finally falling into place, but who is in the business of love and its cascades and cataclysms. It is about God who does not want us so much to be better as to be lost – lost without a compass in the wilderness of God; lost, as the great hymn says, “in wonder, love, and praise,” disoriented to ourselves and reoriented to the One who is all in all. This entry was posted in Lent and Holy Week, Sermons on February 11, 2013 by sicutlocutusest.